So that we can build a strong case to have the best opportunity for the maximum settlement or if necessary represent you to the best of our ability in court. With decades of experience and dozens of successful cases as a Florida lawyer, James Vickaryous knows when to settle and when to go to court although ultimately that is your decision. We’ll keep you fully informed and supported every step of the way. We believe that communication is the key to a successful Florida personal injuries case and we’ll use it to put the responsibility for your injury right where it belongs, in the lap of the guilty party. We’ll educate you and inform you as your suit progresses so that you will never be wondering about the status of your case. When all is said and done, you’ll be happy you chose Attorney Vickaryous to be your Florida accident attorney. Florida has 67 counties and twenty judicial circuits. James Vickaryous has argued cases in courthouses across the State of Florida. If you want a complimentary consultation with a Florida accident attorney, call James G. Vickaryous today. To find out how we have helped other clients, visit our Settlements & Verdicts page. 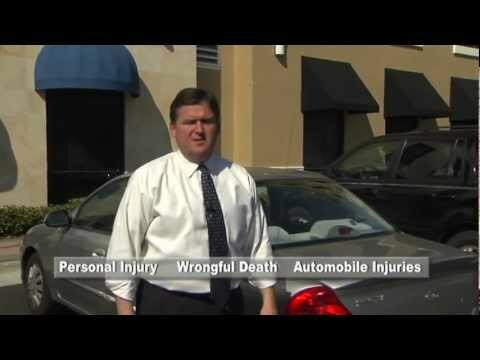 Our Florida lawyer team has as extensive experience in all types of motor vehicle accidents. We promptly and thoroughly investigate each case to assess liability and determine fault and work to obtain photographs and witness statements to ultimately prove your case.Serious car and other motor vehicle accidents require the guidance of an experienced Florida lawyer. We have years of practice and an impressive track record representing people who have suffered significant injuries in motor vehicle accidents (commercial and personal). We work with physicians and other health care providers to assess and review all the short and long-term medical aspects of your case. Our detailed understanding of Florida’s automobile, insurance and liability laws means we understand the different sources of recovery available to car accident victims and their families as well as the various theories of liability that enable those victims to collect from the parties who caused them harm. Our Florida lawyer team represents individuals and the families of individuals who have been seriously injured or killed as a result of the negligent or wrongful conduct of others. We take each wrongful death case on as if it will proceed to trial and we are not afraid to take a case all the way to jury verdict if that is what is necessary to produce the best possible result. Our firm represents individuals injured in all types of situations including industrial, construction, and equipment-related accidents. Compassion, understanding, and excellence are some of the traits that a person should look for in a wrongful death lawyer. Unfortunately, Florida has a high rate of wrongful death. Florida can be a very dangerous place to drive a car. Every year, loved ones across the Florida grieve the loss of family members that die as the result of wrongful death. Wrongful death is a type of personal injury which may be caused by many unfortunate events, including: automobile accidents and collisions, pedestrian collisions, medical malpractice, nursing home abuse, defective products, attacks caused by negligent security, and slip and falls caused by negligent upkeep. The unexpected passing of a loved one may leave family members with many expenses, such as hospital, funeral and burial costs. You may be able to receive maximum compensation for these expenses along with the compensation of your loved one’s lost wages and the loss of your loved one’s companionship. Often a defective product can cause grievous bodily injury. We have helped many clients that have been injured by defective products bring a claim against the manufacturer. The list of products that have manufacturing defects are as long as the list of products that are made and sold. Many products have defects that you don’t learn about until you use them and are injured by them. If you have been injured by a defective product, please contact us and let us know how you were using the product when it injured you It is extremely important to keep the defective product in a safe place and in your custody and control. If you lose the product, there is very little chance at winning your case. Premises liability is a rather vague term that serves as a catchall for many types of events including those involving structural design flaws, unsafe conditions, environmental hazards, improper traffic patterns and a wide range of other issues unrelated to security per se. In many cases, security related premises liability matters involve issues such as physical security standards and generally accepted security practices. In addition to any existing standards, crime statistics, event history, community standards, and specific risk considerations play a part in determining whether an adverse event was foreseeable. Premises liabilities cases will often allow damages based on pain and suffering, lost wages and medical expenses. Further premises liability may also compensate the surviving family members in the event of death as a result of qualifying injuries. Property owners don’t have the duty to protect you from hazards that you know about. However, they do have a duty to protect you and warn you about dangers that you don’t know about. Property owners and business establishments have a duty to provide a safe environment for individuals on their premises. Many slip and fall injuries are the result of badly maintained properties. Parking lots and sidewalks often have cracks and debris that are hard to see and cause a person to trip. Wet floors with no warning signs, store clerks leaving boxes in walkways, air conditioning ducts leaking water onto the floor, uneven floor surfaces, poorly marked changes in elevation, uneven elevators, broken steps, unmarked ditches all can cause great injury to the unwarned person. One of the biggest dangers that Florida tourists often are not aware of is the amount of crime that occurs in tourist areas against visitors. Hotels, shopping centers, and other businesses that have a known problem with crime on their premises have a duty to warn customers of high crime and protect them from it. Many of these cases involve victims who have been severely injured, raped or even killed as a result of the business establishment failing to protect its customers from known dangers. Accidents Involving Visitors to Florida – While Florida is a prime tourist destination, some visitors have the unfortunate experience of being in an accident while visiting and on vacation. In addition to determining the party whose negligence was responsible for causing the accident, representation of such visitors requires close coordination of insurance laws between different states and foreign countries. We have represented a great many European visitors, including quite a few from the United Kingdom. Our Florida lawyer team represents individuals who have been injured on a construction site. We help clients to recover money damages for medical expenses, lost wages, pain and suffering, and punitive damages, where appropriate. Often times, there are many different people and companies working together on a construction site. It takes experience to determine the best cause of action against the at fault party. To find out more on how we have helped other clients with a Florida personal injury case, visit our Verdicts & Settlements page or our Testimonials page. If you want a complimentary consultation with a Florida accident attorney, call James G. Vickaryous today.